ShareShack is a social network united by a common passion for the share market. Unlike other on-line share market forums, ShareShack allows you to discover and connect with other people that have the same interests investing in the share market as you. In doing so, you’ll create your own personalised network that you can access for opinions, analysis, insights and ideas to help improve your performance on the share market. ShareShack will connect you with people who are following the same shares on their watchlist, have the same investment style and have a preference for investing in the same industries as you. 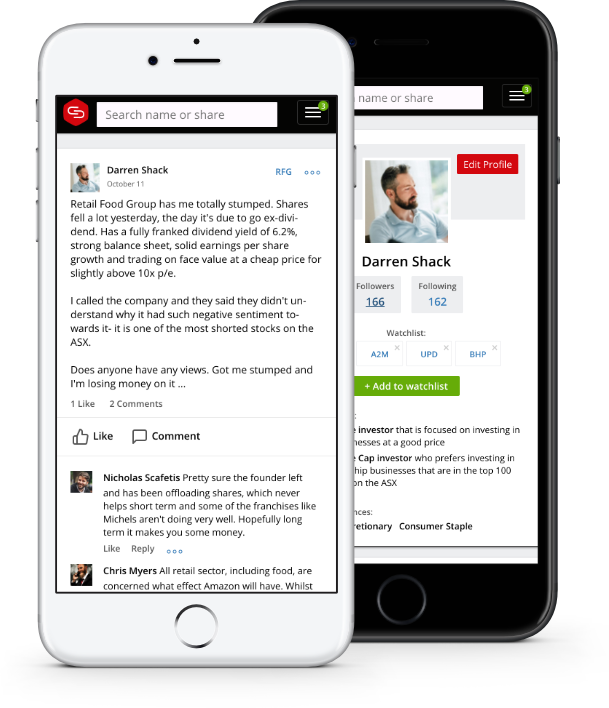 Your ShareShack newsfeed contains discussion, insights, opinions and ideas from people you’ve personally selected to be in your network, that can be filtered to the shares on your watchlist. ShareShack promotes quality discussion by encouraging members to participate in the community using their real identities.